The coming International Firemen’s Tournament, to beheld in London, will be attended by representatives of nearly all of our leading cities, and promises to emphasize the fact that American firemen are in many respects the best in the world. One who has been present at a fire in any of our centres of population must have admired the dash, skill, and precision with which the firemen began and waged their battle with the flames, and must doubtless have wondered, how this skill and confidence were acquired; but an inquiry would have revealed a fact unfamiliar to the general public, that in all the chief cities there have been maintained for years past well – equipped training – schools, where men are regularly and carefully drilled in the art of handling fires and saving lives. The training-school in New York is at 157 East Sixty-seventh Street, the headquarters of the department, a handsome seven-story brick building, erected in 1887 at a cost of half a million dollars. To Captain H. W. McAdams, instructor, come all applicants for admission to the department, and during the past sixteen years, he has drilled more than 40,000 men in the essentials of his calling. 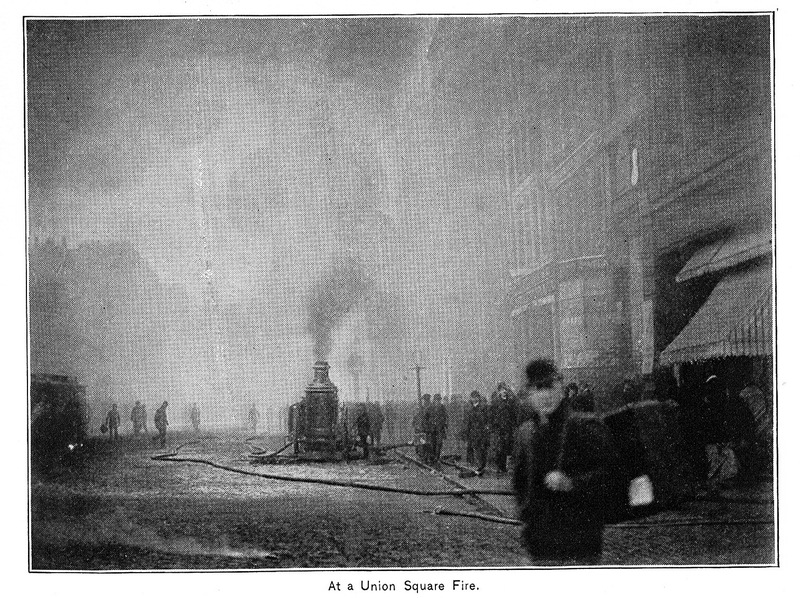 At a Union Square Fire. 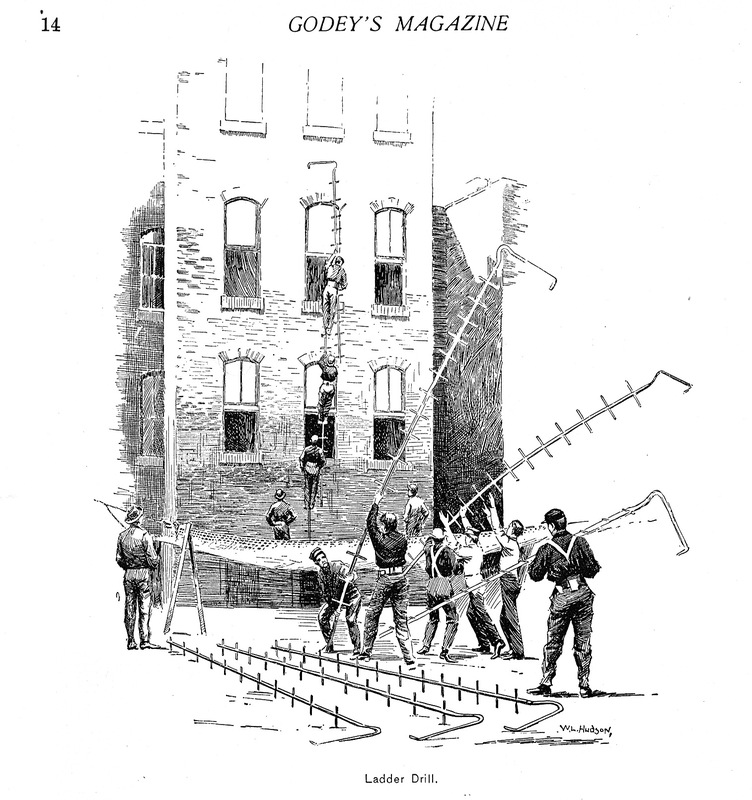 The men are first trained in the use of the scaling-ladder. Each man takes a ladder, and these are secured to the window ledges of the training-school building until a continuous chain is built to the roof. 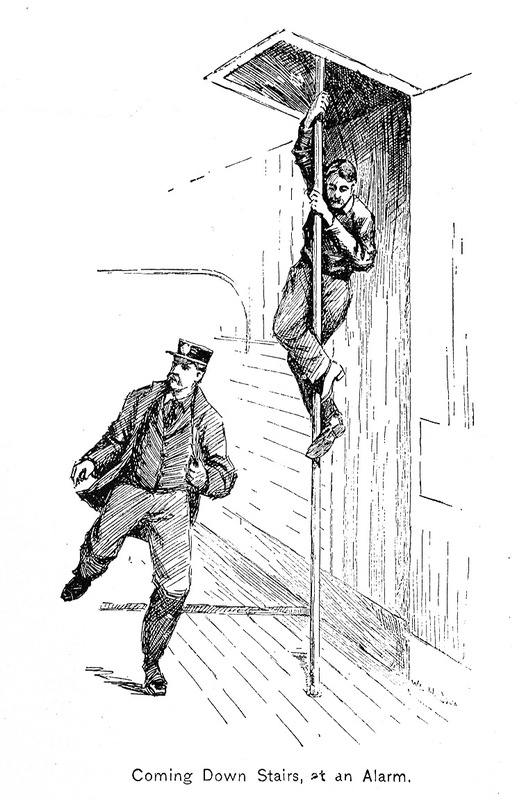 In the hands of well-trained men the scaling-ladder is a most effective appliance for life-saving, and special attention is given to it in theNew York training-school. When properly trained in its use the “standing-on-sill” drill, as it is called, is taken up by the pupils. In this exercise, two men at a time stand on window sills and handle the ladders in building a chain to the roof. The “swinging-from-window-to-window” drill is the next step in the making of a fireman. This is a device resorted to when a building is on fire and the occupants of the top floor cannot be reached from the ground. In such an emergency the firemen can get to them only by going to the top of the adjoining building, if that has escaped the flames, and swinging over to the burning structure. After this, the men are taught to send a lifeline, or, as it is sometimes called, a roof-line, to their comrades on the roof by means of a gun. This life-line is a cord and serves as a connection between the men on the roof and those below. When it has been caught and made fast, it is used to draw a heavy life-rope to the roof, after which a life-belt is given to each man, to be used in sliding down the life-rope. This belt has a large hook attached to it called the snap. One end of the life-rope is fastened to the roof of the building, and when ready to descend the fireman twists the rope twice around the snap in his belt. If he is to take another person down with him, three or four turns are necessary, according to the weight of the second person. 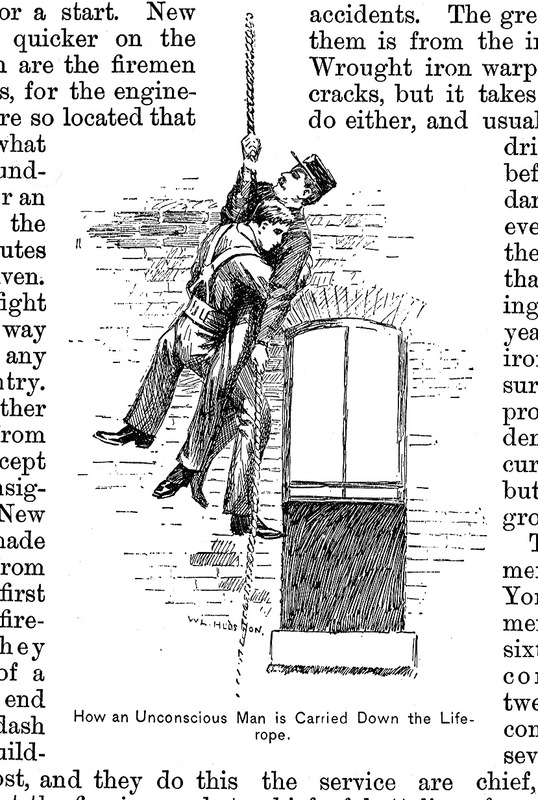 The friction of the rope around the snap eases the descent so that a man has only about five pounds pressure to hold on his hand in powering himself down the building. No other means of regulating the descent has as yet been devised. As a concluding exercise, the men are taught how to jump in case of necessity, and how to hold the Bonner drop-net. The object of this net is to save life by breaking the fall of persons jumping from upper windows. To teach the men exactly how to hold the net, dummies are thrown from the roof. These are elongated bags filled with sand, weighing from 75 to150 pounds. When an applicant has been declared proficients in the exercises I have described and has also passed a rigid physical examination, he is formally mustered into the department and waits for promotion, at a salary of $83 per month. Should it fall to his lot to be assigned to the squad doing duty in Engine House No. 18, at No. 130 WestTenth Street, one of the best equipped and most centrally located in the city, he will find himself under the command of Captain Joseph P. Byrne, a sturdy veteran who has served more than thirty years on the force, and who wears theStephenson medal for general efficiency as a commanding officer. A description of Engine House No. 18, and of the routine followed there will apply, save in minor details, to all the other station-houses in the city. On the ground floor are quarters for two engines and eight horses and on the first floor the cozy sleeping quarters of the men and the office and bedroom of the captain. The second floor is taken up by the sleeping quarters of the other officers and by a large sitting-room where the men gather to read and talk when on house duty. Each man is on duty twenty-one hours a day, with three hours off for meals and twenty-four hours’ leave of absence three times a month. A vacation of ten days is also granted to each during the summer months. One man keeps “house watch” from six o’clock in the evening until midnight when he is relieved by two comrades, who remain on watch until six in the morning. The daily examination and roll-call take place at 8A. M. when all the men appear in full uniform. How an Unconscious Man is Carried Down the Life-rope. When the alarm-gong sounds it is the duty of every man to be out of bed, dressed, down the pole which connects the dormitory with the ground floor, and at his post on the apparatus within ten seconds from the first stroke on the gong; but, as a rule, so perfect is the discipline maintained, before the time limit expires, each man is in his place, every horse is hitched, and all are in readiness for a start. 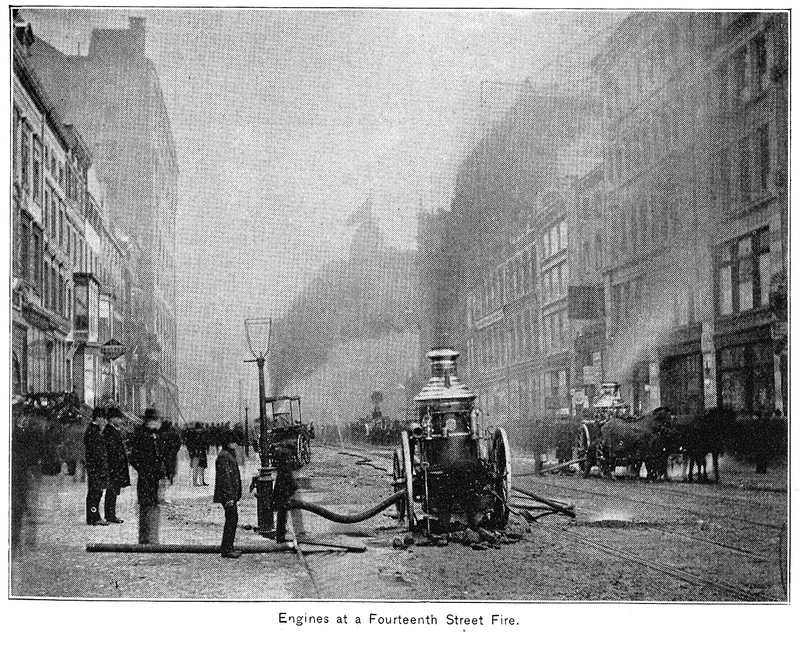 NewYork firemen are quicker on the scene of a fire than are the firemen of most other cities, for the engine and truck-houses are so located that no matter from what box the alarm is sounded, either a truck or an engine can reach the box within two minutes after the alarm is given. Moreover, they fight fires in a different way from the firemen of any other city or country. The method in all other places is to fight from the outside, except when the fire is insignificant, but in NewYork, the fight is made almost exclusively from the inside. The first thing New York firemen do when they reach the scene of a fire is to take the end of their hose and dash into the burning building. No time is lost, and they do this no matter how great the fire is, or what the danger may appear to be. If the fire is in the basement they get there if they can. If it is on the top floor they get there. Wherever it is, they get as near as possible to it so they can be sure that the water strikes the spot that is burning, and is not wasted. They remain inside until the limit of human endurance is reached. One of their number falling from exhaustion or overcome by smoke does not drive the rest away. He is dragged out to the air, and the others keep at work until it is impossible to stay an instant longer. Then they retire and the fight goes on from the fire-escapes, the roofs of adjoining buildings, and the street. The street is the last stand. When the firemen are driven there, there is little hope of saving the burning building, and attention is devoted almost exclusively to the adjoining property. Firemen count the modern building safer to work in than the old-style structures. They take greater chances in them and there are fewer accidents. The greatest danger in them is from the iron frame-work. Wrought iron warps and cast iron cracks, but it takes intense heat to do either, and usually the heat will drive the men out before there is any danger. There is even less danger in the new buildings than in the buildings put up a few years ago, as their on frames are now surrounded by fireproof brick. Accidents, of course, occur now and then, but this yearly grow rarer. Coming Down Stairs, at an Alarm. There are 1,250 men in the NewYork Fire Department, divided into sixty-three engine companies and twenty-two ladder companies. The several grades of the service are chief, deputy chief, chief of battalion, foreman or captain, assistant foreman or lieutenant, and firemen of the first, second, and third grade. Three years of service advances fireman from the first to the third grade and increases his annual salary from $1,000 to $1,400. There are two deputy chiefs, each with a yearly salary of $4,300, and six chiefs of the battalion, each receiving $3,300 a year. A chief of battalion has under his supervision six companies, each composed of two officers and ten men. The annual salary of a captain is $2,160, of a lieutenant $1,800, and of an engineer $1,600. The chief of the department is paid $5,000 a year. At the end of twenty years of service a fireman, if he so elects, may be retired on half-pay for life. In the case of death, by accident or otherwise, the widow or nearest of kin receives $1,000 and a pension of $25 a month. 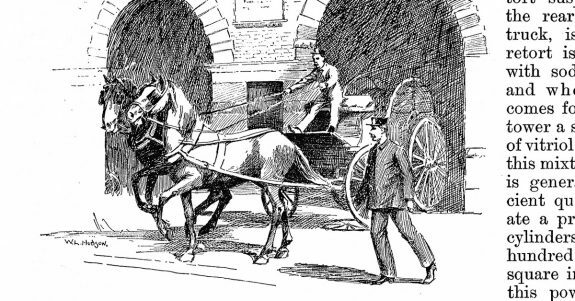 Sometimes when a fireman is incapacitated for more arduous work by reason of some injury received in the performance of duty, he is detailed for duty at the training-school and hospital for horses, in Ninety-ninth Street, between Columbus and Amsterdam Avenues. This branch of the department is housed in a handsome three-story building, to which are brought for treatment all ailing animals, while horses bought on trial are here trained for service. 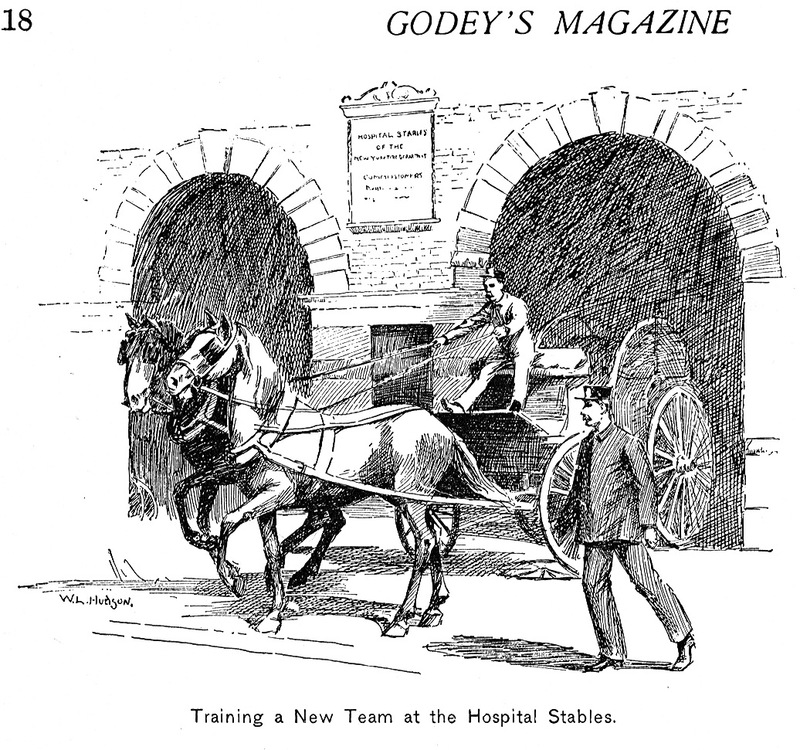 Training a New Team at the Hospital Stables. The training-school consists of two stalls in the rear and at the right and left side of a hose-cart. Suspended in front of this cart are the collar and traces ready to drop on the horse, and to be fastened in a second with a snap-catch. When a green horse is brought in he is first led under the harness, which is allowed to fall on him. This is repeated until he becomes accustomed to it and learns that he will not be hurt. When the horse learns that this is the only place to run to from his stall, a man with a small switch stands behind him. Another man strikes the gong, and at the same moment, the animal is switched lightly on the flank. This starts him forward and he runs under the harness. It rarely takes more than four lessons to cause the horse to associate the sound of the gong with the touch of the switch, and he soon learns to run from the stall without being urged. In a week’s time, he is all impatience to get out for a run. In time he gets to know the alarms, and there are horses in the department that know perfectly well whether the striking bell indicates a fire-box in their district or not. If it is outside, they will remain quiet, but if within the district they will paw the floor of the stall and exhibit every desire to get into harness. The international tournament which opened in London on June 19th is for the benefit of the widows and orphans of the London firemen. Fire crews from all the countries of Europe, and from Japan will compete, and the chief American cities will also be adequately represented, New York sending a carefully drilled life-saving crew under the command of Captain H. W. McAdams.